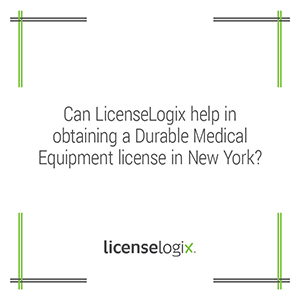 Can LicenseLogix help in obtaining DME license in New York? LicenseLogix can certainly help. First, our license research service will identify the potential licenses that your business might require in every relevant jurisdiction. We will gather all the necessary application forms and present you with a research packet with everything you need to become licensed. Further, LicenseLogix can file all forms for you and monitor your licenses to help your business maintain compliance. We can help you get started today! You can reach us at (800) 292-0909 or click submit a question to have a representative contact you.